The students riffed off of traditional Hollywood star maps that guide tourists to famous people’s homes. The educators challenged the ELARA seniors to come up with their own East L.A. “celebrities” and landmarks, then research, interview, and write profiles of these people and places of value. At first, students claimed there was nothing special about their area. But as they thought harder about the local heroes who influenced their lives and neighborhood, “their sense of pride started to swell,” Blockstein said. Here's the article from Educator Innovator and there's also more info here. What would you include on a map of the South Bronx to celebrate its long history of creation, culture, and community? Last year, I was introduced to the Detroit Community Technology Project at Mozilla Fest and got to hang out a bit with its Director, Diana Nucera (aka MotherCyborg). The Community Technology Project trains community organizers in using technology "with the goal of restoring relationships and healing neighborhoods." This training helps participants to do things like build resilient community-based wi-fi networks or to produce websites to support local organizations and campaigns. At Mozilla Fest, Diana was sharing a new guide they created that gives more info on the popular education and grassroots organizing techniques they use in their training. Community technologists are those who have the desire to build, design and facilitate a healthy integration of technology into people’s lives and communities. Bonus: Diana did a great interview with the Slate podcast Working where she talks more about the project and how she came to do the work she does. Someone who always inspires me, Dr. Nettrice Gaskins, is highlighted in a recent article about the importance of integrating art and technology when teaching. During research Gaskins conducted as a doctoral student, she noticed "there were certain groups that were less represented" in STEAM or STEM, women being key among them. There were also several ethnic groups that were underrepresented: African Americans, Latinos, and native Americans or indigenous groups, she says. A colleague of Gaskins' created a software tool to look at local or cultural knowledge and merge it with CS, and saw positive results, "which led me to believe that the content is the problem; the content isn't engaging the populations that aren't well represented." Teaching CS with culturally relevant or responsive content, she believes, makes a huge difference. Her course is not designed to be a traditional computer course, she emphasizes, and she teaches the principles using 3D modeling, visual arts, music—anything a student might find relevant. You can follow Dr. Gaskins' latest work on her blog and be sure to check out more of her art (like the image above) which she makes using an algorithmic image filtering tool called Deep Style. However, in other scenarios, students are engaged with lower-level uses of technology such as test preparation, reading static online content, and seemingly endless drill and practice exercises. This is leading to an emerging “second level digital divide” in US schools, fueled by differences in how technology is utilized to advance teaching and learning. This dichotomy is especially pronounced in underserved schools. This year, DY's Digital Learning and In School Programs are developing an assessment for schools to address their digital learning needs. We hope to learn more about where our partner schools need more support and where they feel like they are doing well. Do you see technology being used in creative and engaging ways in schools? Is it mostly used for test prep and skill-building drills? Or both? Related to the story above, this report from Changing the Equation offers telling data on how the digital divide is affecting students in poor schools - specifically related to STEM subjects. The story these data tell is straightforward and troubling: At every stage of their K-12 education, students who attend the highest-poverty schools are least likely to have access to STEM resources, experiences, and classes most wealthy parents would demand for their children. As a result, students in such schools suffer disadvantage upon disadvantage over the course of their schooling, and they face dim prospects for rewarding STEM careers. Image credit: Joseph Gruber, CC BY-NC-ND 2. You may have seen the phrase "net neutrality" come up in the news or your social media feeds lately. Net neutrality is the belief that the Internet - all of the Internet - should be available to everyone and access shouldn't be slowed down, throttled, or restricted because your Internet Service Provider (ie Verizon, Time Warner, Optimum) wants it to be. The FCC recently repealed an Obama administration measure to protect net neutrality - and that's why we're hearing more about it. 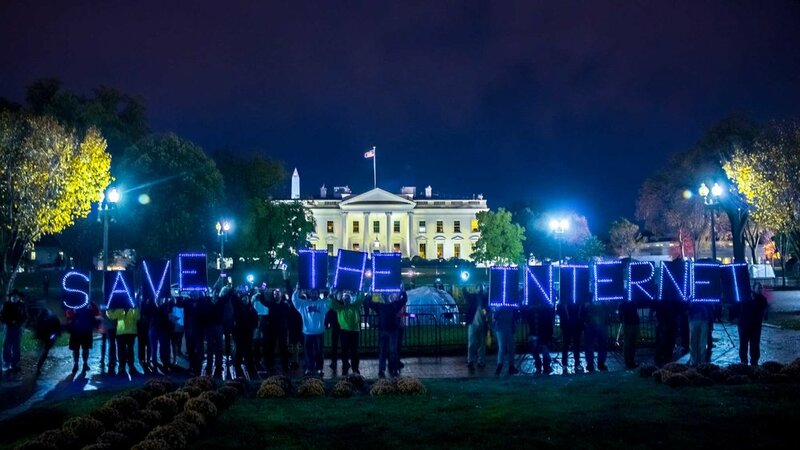 There is a huge campaign to protect open and equitable access to the Internet for all. This opinion piece from a librarian in Wired explains how people in low-income communities would be the most adversely affected if net neutrality is taken away. The NYTimes recently explored how over time artists have been embedded into science labs and the impact they can have on helping people think differently and translating scientific findings to new audiences. As schools move away from textbooks and use more digital tools for students to learn and create with - how should we think about how student data gets gathered and tracked? Corporations are hoping to make lots of money off of selling new technology and curriculum to schools in the digital age - but who's making sure student data is kept private and students have control of their data? How might this data follow young people and be used to help them or hold them back from opportunities? This article on DMLCentral explains how corporations are getting into the business of big student data and what we should consider as it becomes the norm. This article from Remezcla shares a new digital, online archive of Latino art, culture, and history that is a collaboration between Google and 50 institutions. In 1969, Raphael Montañez Ortiz founded El Museo del Barrio to provide a platform for the Latino art that mainstream museums ignored. Since then, things have changed. This fall, for example, LA museums will showcase an unprecedented number of exhibitions that explore the connections between Latin America and Los Angeles. But despite these strides, we still remain woefully underrepresented at these institutions. For years, Latino members of Congress have pushed for a national Latino museum (though the idea first emerged in the mid-1990s) without success. Because we also don’t often see ourselves accurately depicted in film, media, and even in US history classes across the country, many Latinos aren’t able to access their own histories. But a new Google Arts & Culture collection is hoping to correct this imbalance. Launched on September 7, Latino Cultures in the US is one of the largest digital collections of Latino art, culture, and history. As they say in the article, this is nowhere near complete, but it's a good start as a resource for collecting and sharing images and other resources from Latino culture in the US. How might you use it in your classes this year? What collection would you like to see added? Here's another resource from Google! Many of you know I'm a big fan of integrating technology with other topics. Instead of just teaching tech for tech's sake - it's likely we will attract a more diverse group of young people to explore technology if we start with something else they are interested in - like fashion, music, or drawing. Rudy Blanco first showed me the CS First computer science lesson plans which do just that! Check them out here. These lessons cover artistic themes like animation, graffiti, and architecture and use the free coding program Scratch which can be used by students in elementary grades and up. Another curriculum from CS First that I thought was pretty helpful is more geared towards young adults and gaining the digital skills needed in the workplace. This Applied Digital Skills curriculum covers topics like planning an event, creating budgets and presentations, and researching using Google apps. This could be a great resource for young people or families trying out Google tools for the first time. I came across a great downloadable resource for learning about colonization and decolonization from Gord Hill (Kwakwaka’wakw nation). There's a link to the PDF version hereand I also have a print out at my desk you can make a copy of and fold up into a book. I'm highlighting it here and adding a link to the website version because I also think it is a great example of how you can take a powerful analog tool and turn it into a digital one. Making it digital enables easy sharing and might attract an audience who'd prefer to read it online. Have a look and see if it gives you any ideas about a book and/or a website that we could make at DreamYard to share some of our curricula with a wider audience. OK, this is just super COOL! I totally want a shirt that has light-up 3D-printed pyramids on it. This article from Make magazine walks you through how to 3D print onto netted fabric. You can also 3D print onto t-shirts. Woah! Who wants to try it with me? ?